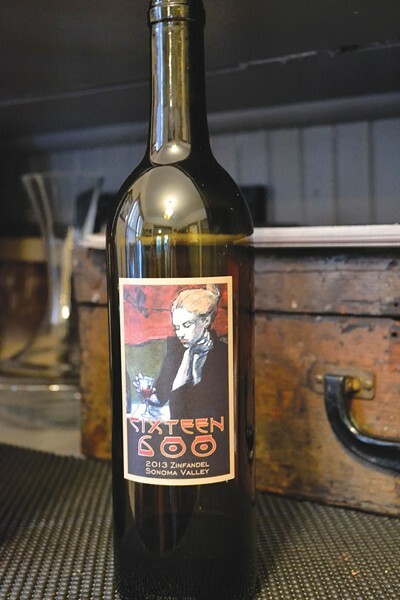 Named for an address in the hills high above Sonoma, Winery Sixteen 600 has been pouring its wines in a little old house on a quiet side street of the city of Sonoma since 2015. Just look for the Stanley Mouse flag flying on the front lawn. Not "freak flag flying," but you hear Stanley Mouse, and that's what you think, right? Actually, this work, by the celebrated 1960s rock 'n' roll poster artist, and which appears on the winery's labels, is Belle Époque and quite demure. Now here's another sign. Lucky for us, it says, "Open." The reverse side says, "In the vineyard—text Sam," and gives Sam's phone number. Sam Coturri runs the winery with his father, Sonoma County organic viticulture guru Phil Coturri, along with some other employees who are generally friends of the family as well, says Ben Pickering, friend of the family and winery employee who describes his job title as . . . well, a bit of everything—vineyards, winery, tastings. Today Pickering is recovering from hosting a bachelorette party, but he's happy to pour us a few samples. Then a few more. Then one for himself—it's about that time of day. Most days, this isn't a limo-delivered party kind of joint, and staff meet with only a few tasters a day in a worn wood-floored cottage that's also the office, furnished with theater seats, a farmhouse table and something like a half ton of vinyl albums. And, yes, plenty of tie-dye. To start, Pickering pours two glasses and sets them on the table without naming them, just for fun. From left to right, they seem to be in reverse order of that day's tasting menu. The first is apricot-scented—it's the 2016 Steel Plow Viognier ($35)—while the second, the Grenache Blanc-based 2016 Hommage Blanc ($35), a field blend with Marsanne and Roussanne from Rossi Ranch, suggests white flowers. The Coturris also farm Landmark Vineyard's Steel Plow vineyard in Kenwood. The 2014 Steel Plow Grenache ($44) brings more fruit to the fore than any version I remember from this vineyard, yet it's the more subdued of a pairing with the toothsome 2014 Oakville Ranch Grenache ($64). Also on the menu recently, 2014 Dos Limones Syrah ($44), 2014 Val Rossi Hommage ($64) red Rhône blend, and 2013 Hamel Family Zinfandel ($35). There's even something for Cabernet fans, too, at this address. Winery Sixteen 600, 589 First St. W., Sonoma. By appointment only; $35 tasting fee waived with "a couple of bottles" purchased. 707.721.1805.